Is Your Border Collie Bored? Rent Some Sheep! A Border Collie is a great dog to share your home with, as long as you can keep up with them. Because they are so smart, it’s easy for them to dream up things that get them into trouble. They also need a lot of exercise and mental stimulation. The Border Collie was born to herd, but if you don’t have any livestock, what can you do? One option to consider is renting sheep. 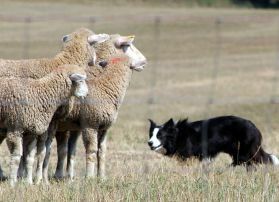 In fact, sheep rentals are on the rise as owners with bored Border Collies search for ways to entertain their dogs and give them some much needed exercise. Dealing with any bored dog, regardless of his breed, can leave your home in a shambles and a perfectly good couch ripped to shreds. It’s not the fault of the dog who releases pent up energy while he’s home alone. Border Collies aren’t made to just sit around twittering their paws waiting for us to come home. They need plenty of stimulating action that allows them the opportunity to stretch their legs and minds. I’ve learned from experience just how smart a Border Collie is, and that they need lots of exercise. On the plus side, it forces me to get some much needed exercise as well. Border Collies originally came from the border area of Scotland and England, and are thought to be descendants of dogs used by Vikings to herd reindeer. It’s said that a Border Collie has a hypnotizing stare and is able to control sheep and other animals with their intense eyes. With no sheep to herd, they turn to cats, kids, adults and other dogs as the next best thing. They don’t care what they herd, they just want and need something to control. After all, that’s what they’re good at and it’s the reason for the breed. The best solution is to have a herd of sheep for your dog, but if you don’t have a herd of your own, the next best thing is to rent some sheep. Fido’s Farm is located in the Evergreen Valley between Tacoma and Olympia in Washington state. For $15.00 a day, you can take your bored Border Collie to Fido’s Farm to learn and practice the art of sheep herding. And if your dog gets bored herding sheep, there are ducks too, for an additional $5.00. If your dog has his eye on larger livestock to herd, $25.00 will get you cattle, when they are available. Fido’s Farm averages 18 dogs each day. But before a dog is turned loose on the sheep, they must be evaluated to make sure the dog won’t harm the sheep. Most farms will give your dog a “herding instinct test” before allowing them the freedom to chase their sheep. Border Collies have a natural instinct to herd, but they still need to be taught what is and isn’t acceptable behavior. Some dogs may be afraid of sheep, others rush headlong into a herd, and some may be biters. For a dog that has never seen sheep, let alone had a chance to actually herd them, the farm offers classes so your dog can learn how to do the job he was bred to do. Fido’s Farm also has agility classes for those who are just getting into the sport, those with medium skills and an advanced handling class. If you want to teach your dog flyball, rally, obedience or tracking, classes are offered for each one. There’s something on the farm for every dog whether you have a Border Collie, one of the other herding dogs or a mixed breed. To find sheep herding farms in your area, Google your town and state along with “sheep herding farms.” If you don’t find anything, then your next option is to find where a sheep herding trial is being held. This is a good place to meet people who can help you find someone in your area that rents sheep. Finding a farm close by may be a challenge, but if you have a bored Border Collie, it’s worth the time to search out a farm with sheep to rent. Border Collies are gifts to farmers. They can really make good farm companions. I am sorry but sheep are living and feeling animals and no toys for bored dogs… They have to be cared for in an appropriate way – they have their needs, too, and I doubt that most people are able to care for them as they needed. If your Border Collie is bored, get a hobby for him/her! Mantrailing (or anything for their nose to do) or Obedience or even Agility for some dogs. Border Collies do not have to herd – they just need some brain work! They are clever, faithful and hardworking! What a beautiful breed it is!!! Thanks for your sweet words on Gods Little People. I love your articles – and what a great story about Bullet and Trigger making their way “home” again. Great story! I have a border collie and I used to have 3 goats which the border collie would try to herd. She also herds the cats, the other dog, me, and the lawnmower. I personally think it would be kind of dangerous to rent sheep to people that have a border collie that has never seen sheep or had any training. I took my dog to school a couple of times and she just didn’t take to it. She wanted to just chase them. They really do need a lot of training.